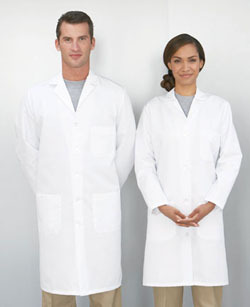 - RedKap Men's 5.0 ounce Lab Coat. - Lined notched lapel collar. - 41.5" back length on all sizes. RedKap Men's 5.0 ounce Lab Coat. Performance blend, 80/20 poly/cotton fabric. Left chest pocket with pencil stall and two lower pockets. Lined notched lapel collar. Side vent openings. 41.5" back length on all sizes. 34-48: White.